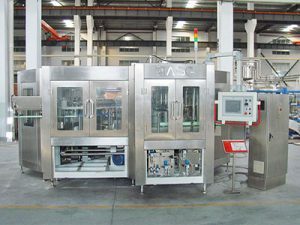 This glass bottle carbonated drink filling machine is sent to the Russian speaking countries.There are plenty of carbonated drinks sold to Russia.We are a strong Chinese manufacturer in the China filling machine industry. 1.This 3-in-1 set is used for filling carbonated drink. 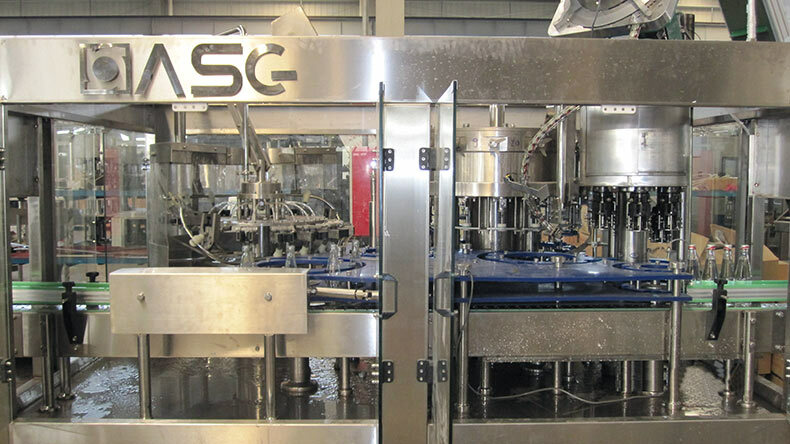 This glass bottle carbonated drink filling machine contains washing filling and capping with complete automation, suitable for filling carbonated drink into glass bottles.Glass bottle filling machine can be used for all kinds of glass bottles.2.The bottleneck blocking makes the process of changing bottles easily by only adapting the height of conveyor chain. 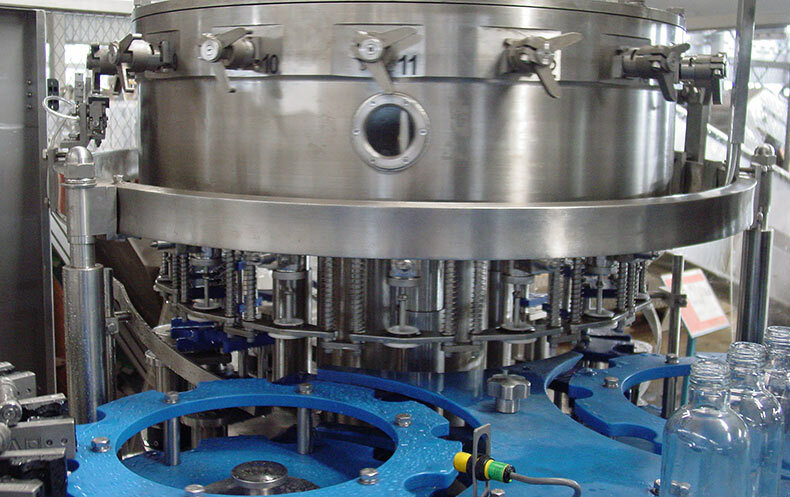 The filling process adopts the micro-pressure technology, which makes filling process faster and more stable. 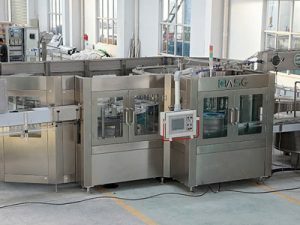 3.The glass bottle carbonated drink filling machine has applied advanced inverter control technique, the key electric parts are all products of world famous brands. 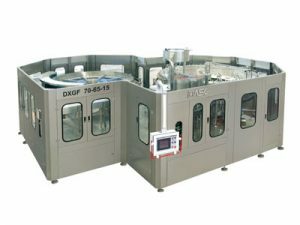 4.Compared with other equipment of the same kind this carbonated drink filling machine possesses a better quality and thus enjoys a high ratio of function against price. 1. 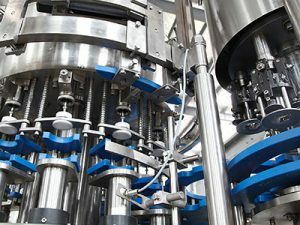 Use move wheel in the bottle directly connected technology; canceled screw and conveyor chains, this enable the change the bottle-shaped become easier. 2.The parts contact with product is made of quality SUS, anti-corrosive, and easy to clean. 3.The capping head adopts constant torque magnetic device to guarantee capping quality and impact cap. 4. 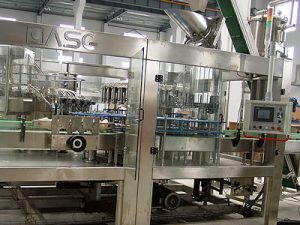 Glass bottles transmission adopt clip bottleneck technology, bottle-shaped transform not need to adjust the equipment level, only change related the curved plate, wheel and nylon parts is enough. 5. The specially designed stainless steel bottle washing machine clip is solid and durable, no touch with the screw location of bottle mouth to avoid secondary pollution. 6. 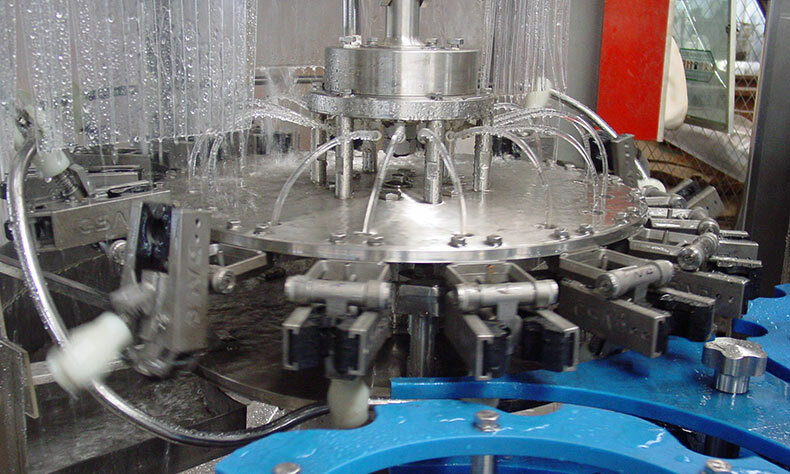 High-speed large gravity flow valve filling valve, filling fast, filling accurate and no liquid lose. 7. 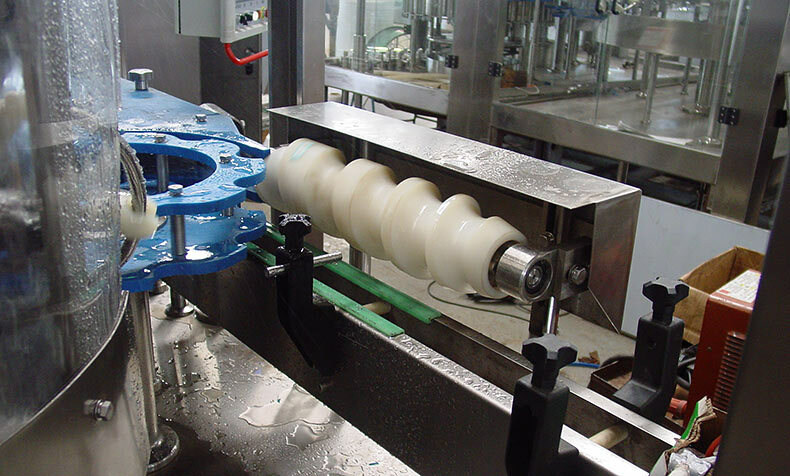 Spiraling decline when output bottle, transform bottle shape no need to adjust the height of conveyor chains. 8. Host adopt advanced PLC automatic control technology, the key electrical components from famous company such as Japan\’s Mitsubishi, France Schneider, OMRON. 9. 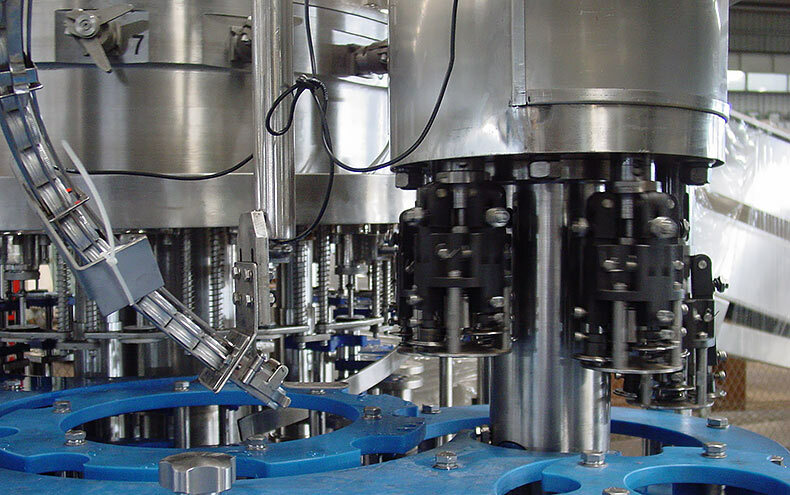 Adopting clamping bottle neck way to wash bottle mouth and avoid touching screw mouth, adopting clamping bottle neck way in the whole conveying process. 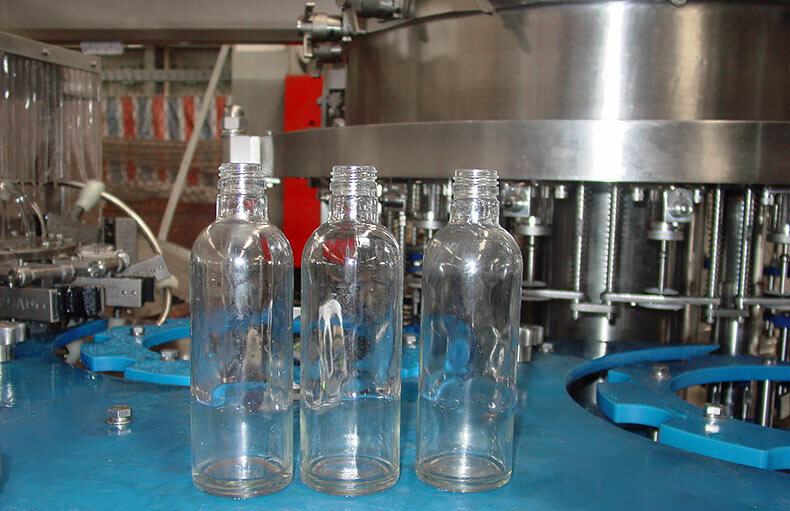 When bottle type changes,you only need to change the board related with glass bottle diameter. 10.The main electric components, frequency, photoelectric switch, proximity switch, electric control valves all adopt imported components, which can ensure the quality performance. 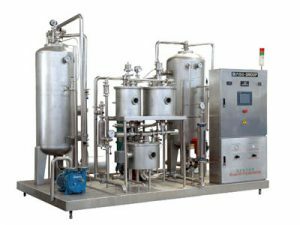 11.The control system has many functions, such as control producing speed, cap shortage detection, bottle block automatic stop and production counting etc. 12.The electric components and pneumatic components are all introduced from world famous brand products.